You are buying Abbott Ensure Plus Nutritional Shake Gluten-Free Strawberry 8oz Each, model #57269. ADW Diabetes offers a complete line of dietary supplements for both children and adults. 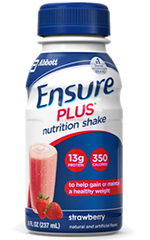 The Abbott Ensure Plus Nutritional Shake Gluten-Free Strawberry 8oz provides active adults with a source of nutrition that can help them focus on specific nutritional goals. Such goals include helping to rebuild muscle and strength naturally lost over time, supporting digestive tract health and the immune system, and helping build strong bones. Ensure is available in a variety of uniquely formulated, ready-to-drink, shakes in popular flavors, as well as in pudding and powder forms. ENSURE PLUS provides concentrated calories and protein to help patients gain or maintain healthy weight. ENSURE PLUS can benefit patients who have malnutrition, are at nutritional risk, or are experiencing involuntary weight loss. Used to help gain or maintain a healthy weight. For oral use. A source of Complete, Balanced Nutrition. Water, Corn Maltodextrin, Sugar, Milk Protein Concentrate, Canola Oil, Corn Oil, Soy Protein Isolate. Less than 0.5% of the Following: Whey Protein Concentrate, Magnesium Phosphate, Potassium Citrate, Natural & Artificial Flavor, Sodium Citrate, Soy Lecithin, Calcium Phosphate, Potassium Chloride, Choline Chloride, Ascorbic Acid, Salt, Carrageenan, Potassium Hydroxide, Ferrous Sulfate, dl-Alpha-Tocopheryl Acetate, Zinc Sulfate, Niacinamide, Manganese Sulfate, Calcium Pantothenate, FD&C Red #3, Cupric Sulfate, Vitamin A Palmitate, Thiamine Chloride Hydrochloride, Pyridoxine Hydrochloride, Riboflavin, Chromium Chloride, Folic Acid, Sodium Molybdate, Biotin, Sodium Selenate, Potassium Iodide, Phylloquinone, Vitamin D3, and Cyanocobalamin.